This, That, and The Other Things!! So it is inspiration Friday, once again. I got inspired yesterday, to start decorating for the 4th of July. Thought you might like to be inspired, to get out the red, white, and blue. I went to my favorite little thrift store yesterday, just to look around. I got more flags for my collection. Every year I buy more. I got some big ones for outside, but the ones you see under the cloche are all from that thrift store. I got them all for the low, low price of $4.00, including 4 or 5 bigger ones. I also wanted to share with you this cute little tea cup bird nest, that I bought from Becca at of Bluebirds and Roses. It arrived last week, and I think it is adorable. Check her site often for new items. It's a fun place to browse, as well as reading her blog. Sophie, of Sophie Honeysuckle wanted to see people's beds, so here is my bed Sophie. I wanted you to see the crown that I received from my tiara/crown swap partner Maria. Check her blog sometime. The junk drawer. Get out those flags, and enjoy!! Yesterday, my husband Mark had a day off from work. We decided to stop in Summerland, on our way to a concert in Santa Barbara. Summerland is a quaint little seaside community right near Montecito, (Where Oprah has her compound). Near Santa Barbara. In the 1800's, Summerland was a Spiritualist community. Now it has upscale antique shops and cafes. A couple of cute inns, and The Big Yellow House. This use to be a house turned restaurant. It was suppose to be getting a face lift, but it looks like work has stopped on it for now. Oh yeah, and it is suppose to be haunted. (I've eaten there, and I never saw the ghost) Darn!! 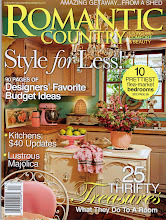 Rue De Lilly Antiques, has been featured in some home magazines. It has really lovely French antiques and a back garden. I took a picture of this little dove, sitting out on the porch. I saw many french cages. They were all huge and very expensive. All of the shops here are 3 and 4 times what you would pay at a flea market, but it is fun to browse. We did finally get to Santa Barbara for dinner, and then to the Santa Barbara County Bowl, to see, The Goo Goo Dolls, and Lifehouse. We had a great time, with loud rock music under the stars. Hope you enjoyed this little field trip, I did. I wanted to buy everything I saw, but I don't have Oprah's budget. Darn again! Santa Monica Flea Market Day! Welcome to the Santa Monica Antique Market!! This is where I spent my Sunday morning. Love the Sand and Sea sign. I didn't buy a lot today, but what I found was great. The little loving cup is from a 1954 Regatta, and only $10. The glass jar is from France. I am going to use it for ribbon scraps. I bought 3 old spools to use for ribbon. I got some great old ribbon and millinery flowers. I also got a deck of Spanish tarot cards. I though they would be great for my collage/cards. We did have 2 celebrity sightings today. Marisa Tomei and Geena Davis. That was fun! Santa Monica is always a good place for spotting a celeb or 2. My husband Mark got nothing, because it is quite the girly flea market. He patiently waited, while I lingered at each and every booth. It's inspiration Friday, so here is a little inspiration, to find the beauty in chippy paint. I can't help but love these pieces of history, well, at least somebodies history. I often wonder where these came from, or who owned them before me?? I am always drawn to pieces like these, at flea markets, antique shops, and garage sales. I can't help myself. For me, the chippier the better! So enjoy a little bit of my ever growing chippy collection. I am off to the Santa Monica Flea Market on Sunday. Who knows, maybe more chippy paint?? I am participating in the garden swap. I have never done a garden swap before, or any other swap until now. These things are all ready to be packed up and sent to my garden swapping partner Dolly, of From my Cherry Heart. She lives in Michigan. I didn't want the pictures to give too much away, in case Dolly is looking at my blog. Last week I finished making a crown for the tiara/crown swap. My partner is Maria from Arizona. Her blog is, The Junk Drawer. I have to say that making a crown is something I haven't ever done before, except the tiny one that I made for my dress form Isabella Crane. Now I can add swapping to my list of firsts. It was fun, creative and entertaining. If you haven't done one of the swaps yet, maybe you should try it. I will definitely be excited to see what comes in the mail for me. I will put them on my blog for all of you to see. Maria and Dolly are really nice ladies. Be sure to check out their blogs sometime, if you haven't already. Well, I have two swaps done now, so I am an experienced swapper. Hope you all have a great Wednesday, and happy swapping. Oh, and thanks to all of the nice ladies who put these swaps together, Holly Doodle, and Bella Enchanted. garage sale a couple of weeks ago, for only $10.00. The picture on the right, is the one, as I was working on it. It had some really ugly fabric in the doors before. I ripped it out, and primed and painted the inside, a sage green color. I did the rest in a cream. I had to replace a few of the glass handles. I added some chicken wire to the upper doors. I thought about glass, but didn't want to pay more for glass, than I did for the whole entire hutch. I am very excited to be organizing all of my art supplies into one spot. It's amazing what you can get for $10.00. I hope you are all having a nice weekend, and a nice Father's Day! We had brunch in the garden this morning. It was my husband Mark of course, and our daughter Amanda, her fiance Joe and my Mom. I made broccoli and cheddar quiche, as well as mushroom and cheddar. Fruit salad, bagels, ham, and turkey sausage. We also had cranberry and blueberry teacakes from the Savory Bakery in Ventura. Coffee and mimosas too! I thought you might like a glimpse into the corners of my yard. I'm sure you know by now, that I love decorating with flea market and garage sale finds. The yard is no exception. The cute little garden gate came from, where else, the Ventura Flea Market. It leads down a path to my Secret Garden. The cute green shutter also came from the Ventura Flea Market. This tree, is a curly willow that we only planted last May. I love the curly willow. It will eventually grow like a tunnel that you can walk through. I had to show you, my shabby old chair that I got from one of my walks around the neighborhood. (Someone was actually throwing it out). Last year we planted this grapevine, and now it has the biggest grape leaf that I have ever seen. I hope you enjoy seeing a little part of my yard. I love just walking around, or sitting and reading a favorite magazine, and sipping iced tea. We will be out there on Sunday, having Father's Day brunch. Just thought I would say hi this morning, before my friend Joan picks me up for my Birthday breakfast. We are eating, instead of walking this morning. Since today is my Birthday. Thought you might like to see the beautiful diamond earrings that my husband Mark got me. They are so pretty, and so me. It's hard to tell from the picture, but take my word for it. They are very antique looking. Last night my daughter Amanda took me to dinner, and tonight it's off to dinner and a movie with Mark.